The Sainte Eugenie church is a splendid Roman-Byzantine style edifice dedicated to Sainte Eugenie, patron saint of Eugenie Empress of France. The entrance is through a large carved door and inside you will notice, among other things of interest, the statue of Our Lady of Good Help, patron of the church, and of Saint Martin the patron of Biarritz, as well as the fonts made with sea shells, the white marble altar, the organ (honorary award at the Universal Exhibition of 1900) and the podium with stained glass representing biblical scenes. The Sainte Eugenie church plays host to many concerts during the summer. The Imperial Chapel was built in 1865 on demand by Eugénie de Montijo, wife of Napoleon III. This charming chapel is a perfect combination of Romano-Byzantine and Moorish architectural styles. It is dedicated to the black Mexican virgin, Our Lady of Guadalupe. It was classified as a historic monument in 1981. The Orthodox Church was built thanks to the intervention of Tsar Alexander III and the dedication of Father Herodium. It was inaugurated in September 1892 in the presence of members of the Russian imperial family. At the time Biarritz was a popular destination for the bourgeoisie and the aristocracy of Moscow and St. Petersburg, and September to November was the Russian season. 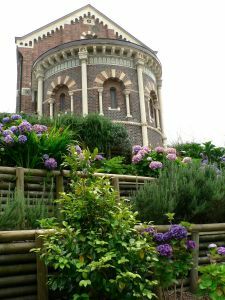 A classified historical monument, the church is one of the symbols of Biarritz. The church is dedicated to St. Charles, the patron saint of Mr. Hézard, founder of the 'Salines de Briscous', (salt factory) and President of the Society of the Thermes Salins (saline thermal spa), who in 1894 got permission to open a chapel in the basement of the thermal baths. The Parish of St. Charles Parish was created in October 1969. 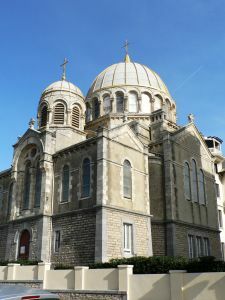 It finally became part of the parish of Notre-Dame-du-Rocher on its creation in 1998.